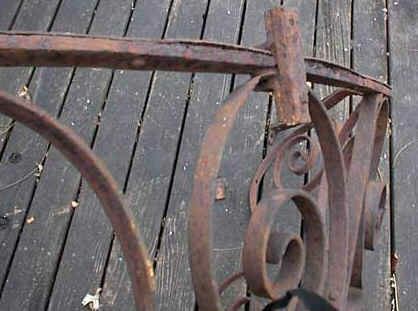 In 1999, an anonymous donor gave GLSPS the handrail cage to the spiral staircase that once existed on the open afterdeck of the SS America. It had been removed from the shipwreck, a popular dive site at Isle Royale, back in the 1960's. Shortly thereafter another diver of that period mentioned to Ken Merryman, then president of GLSPS, that he possessed the rest of the spiral staircase. He said he might be willing to donate it to GLSPS at some future time for placement in a museum. 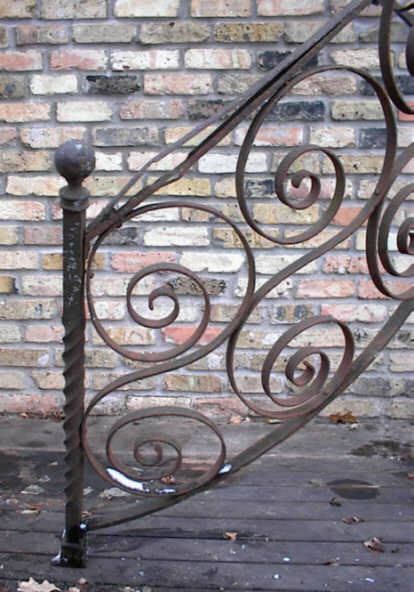 So GLSPS had been storing the handrail cage pictured below in hopes of sometime joining it with the staircase to place it in a public museum. Right now the preferred place would be the Tofte Fishing Museum which already has a nice America display and a growing number of visitors per season. Tofte was a port of call for the SS America and would seem to be a natural place for the display. Below are the photos of the staircase handrail cage. 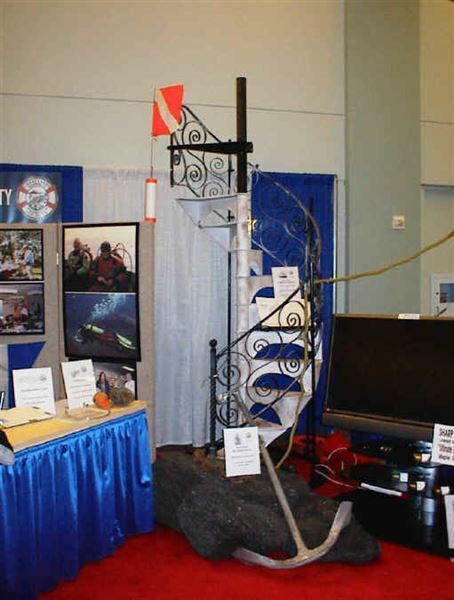 In 2006, the Minneapolis Boat Show solicited GLSPS to be a featured display in the show and offered to donate some funding that could be used to help preserve the handrail if we would display it and several other PIB artifacts in the show. 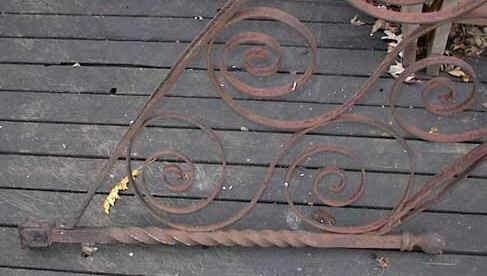 This gave us the opportunity to proceed with the conservation of the handrail and building of a display. 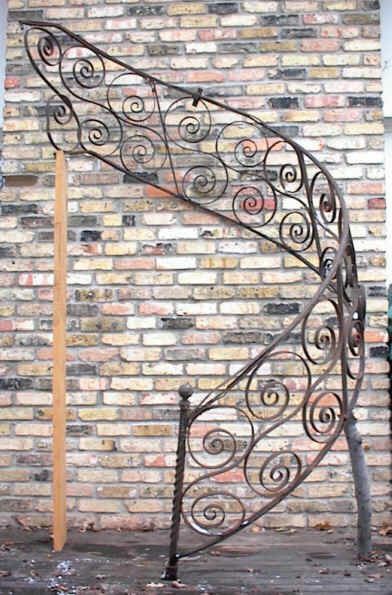 It still appears the mating of the handrail cage and staircase may be a few years off so we decided to build a replica of the staircase to go with the handrail until that time. The pictures below show the display that we will offer for placement in the Tofte Commercial Fishing Museum. Tom Brueshaber, his friend and machinist Elmer Wittman, and Ken Merryman built the stand and display. After the two pieces were preserved and joined again, it was transported to Superior Magazine's Offices in the main lobby. Since then it has been out on loan to the Great Lakes Aquarium in Duluth for the "Shipwreck Display". After the Aquarium is done using it on the shipwreck display, it will be transported up the North Shore to the Tofte Museum where many other S.S. America artifacts are displayed. 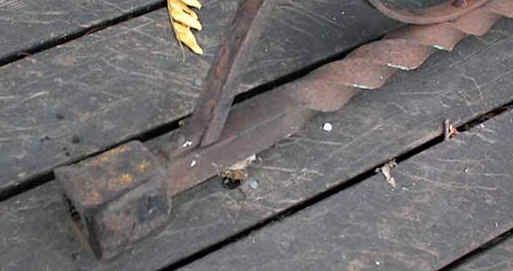 The staircase handrail was in poor shape when the GLSPS received it. 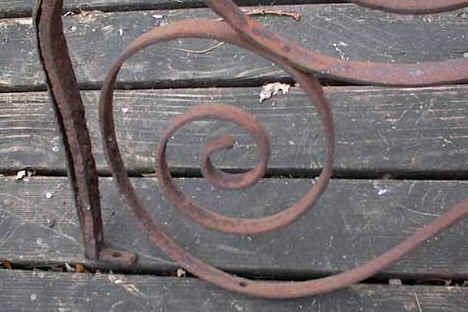 The metal had rusted considerably from forty years of storage in a barn. 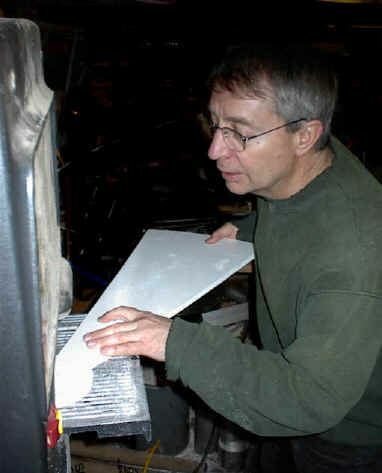 Ken Merryman cutting treads for stair replica. Final staircase display at Minneapolis Boat Show January 2006.